Anderson Flats is only a three-hour drive from the Bay Area. The campground is usually quiet, except during hunting season, with plenty of shade, a cool creek and an outhouse nearby. 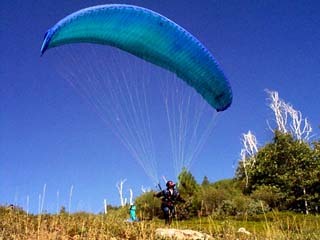 It is flyable from early spring to late fall, and even during the winter, if there is no snow on the road to launch. Early morning and end of the day sled rides are typical, along with late morning to late afternoon thermal flights. Pilots have already logged flights of more than three hours and have reached 8,000' M.S.L. From the air, the views of Yosemite Valley are breathtaking. We are still mapping out the site, exploring the possibilities of cross country flying, and searching for additional launches and landing areas. We have a lot more to learn about the terrain and weather conditions. As with many mountain sites, no two days are alike. Sometimes the thermals are small and punchy and other times they are big and fat. Making it to the main LZ may be a problem, depending on the wind and the performance of your wing. But we have learned that a weekend at Anderson Flats has promise of at least one good flight! Anderson Flats can be an intimidating site. The LZ is surrounded by tall trees and can be quite turbulent. There are no appealing bail-out options (including the alternate LZ), as the terrain is uneven and covered with trees, rocks and snags. Coming in with a high approach is the safest option. In strong head winds, there is the constant threat of sinking fast and having to land out. The best wind direction is a light southerly. Whenever the wind has a western component, there can be a rotor from nearby Pilot's Peak. Although the site has big lift, there is also big sink An early morning sledder is the best bet for first time pilots. Intermediate and advanced pilots, looking for thermals, should launch in the mid to late morning. The LZ is usually gusty during the afternoon and it can be hard to get down. There can be late afternoon/early evening flights, mostly extended sledders, and there have been glass-offs during the summer. Gene's launch is at 5,400' and the LZ is at 3,400'. If you get high, the views of Yosemite are breathtaking. If you haven't flown at Anderson Flats, be sure to get a site intro from a pilot who has had experience at the site. The site records are 10,500' in altitude and three hours in duration. So far, only short cross country flights have been attempted from here, mostly because of the lack of bail-outs. However, the views from above make it really tempting and I wouldn't be surprised if some bold pilot gives it a try before too long! Take HY580 and HY205 toward Tracy. After the Tracy bypass take HY5 for about 1 mile and then turn onto HY120. (The sign says Sonora or Yosemite.) Stay on HY120 until you are within 1 mile of the cabin. On HY120, after Manteca, take HY99/HY120. Veer left to head north on HY99 for about 1 mile and then get off of HY99 and stay on HY120. Go through Escalon and Oakdale. Turn left in Oakdale to stay on HY120 and Hy108. About 20 or 30 minutes after Oakdale, turn right (the sign says Yosemite ) to stay on HY120. HY108 continues on to Sonora. You will go through Chinese Camp, Moccasin, Big Oak Flat and Groveland. Approximately ten miles from Groveland, you'll see a sign that says "Buck Meadows." Look for a restaurant called "Yosemite Ridge Resort" (about ¼ mile after the Buck Meadows sign). Turn right onto the road opposite the restaurant (it's called Hamilton Loop Road, but you will not see the sign until you go ~¼ mile). At this point, turn left onto Moore Creek Road. The road is paved for ~1 mile. After 4 miles, you will pass Brush Ridge Road on your left. You will cross a bridge at 4.7 miles. Shortly after crossing the bridge, the pavement starts again. At 5.9 miles, Moore Creek road meets Greenly Hill Road. Turn left onto Greenly Hill Road and reset your odometer. The pavement ends again and Greenly Hill Road veers to the right at .7 miles. (If you go straight, you'll be on Old Yosemite Road). At 5 miles turn left, before crossing the bridge for Bull Creek. At 10.7 miles from the Moore Creek and Greenly Hill intersection, you will cross a cattle guard. At 10.9 miles you are at the LZ. The LZ is less than one quarter of a mile past the cattle guard, in a big meadow surrounded by tall pine trees. The total distance from Highway 120 to the LZ s 16.8 miles and the total drive time is about 35 minutes.